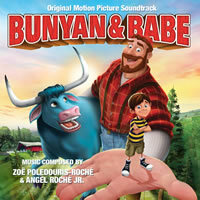 BUNYAN & BABE - Original Soundtrack by Zoe Poledouris-Roche and Angel Roche Jr.
Bunyan & Babe is the newest animated film from Exodus Films. Featuring a wonderful score by Zoë Poledouris-Roché & Angel Roché, Jr of the L.A. based rock band, Looner it also contains the last recording by legendary film composer, Basil Poledouris (Robocop, Blue Lagoon, Starship Troopers, Red Dawn). Of the many composers we love here at Notefornote, Basil is among the most loved. His music is like listening to perfection. The melodies, the beauty, the themes. It's just breathtaking and takes us to another place whenever we hear anything he composed. Bunyan & Babe features the voice talents of John Goodman, Jeff Foxworthy and Mark Hamill. Our soundtrack release features a wonderful score composed by Zoë Poledouris-Roché and Angel Roché, Jr. Zoe's father, Basil Poledouris started work on the project before he passed away in 2006. His theme is magic, pure and simple and is a must have for Basil's loyal fans. 12 year-old Travis Barclay and his little sister Whitney are sent begrudgingly on a summer trip to visit their grandparents' farm in Delbert County. A greedy land developer, Norm Blandsford, has been buying up the little country town, running the hard working residents off their land. After Travis has a run-in with one of Blandsford's men, he is chased into the forest where he stumbles upon a magic portal to the hidden world where Paul Bunyan lives. Paul has been in self-imposed exile for 100 years, ever since the advent of machines made his role in society obsolete and left him feeling of little value to the new world. Paul, reluctantly, escorts Travis back to the farm. But upon returning, Paul witnesses Blandsford's sinister plan. Suddenly filled by a long-forgotten sense of purpose, Bunyan and Babe, the blue ox, get wrapped up in a brand new adventure and together with the help of their new friends, Travis and Whitney, they save the town. They learn firsthand that you don't have to be big to accomplish big things. Zöe Poledouris-Roché and Angel Roché Jr.